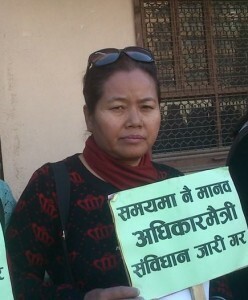 NIAP Womens Rights & Gender Equality Lead and international advisor, Nar Kumari Gurung is a renowned lawyer in Nepal where she is at the forefront of work on ensuring womens rights are a core part of the new Constitution of the republic of Nepal (image to right from a recent rally in support of inclusion of those rights in the constitution). 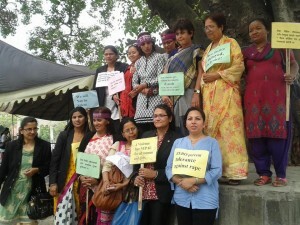 The importance of art as a platform for creatively showing the unique role of women in society, and the issues of inequality and sometimes abuse that they unjustly face, is for Nar Kumari dear to her heart. She is delighted that the NIAP has at its heart the same vision and values for equality and empowerment that matter to her many fellow lead womens human rights campaigners in Nepal. A part of her input to the NIAP is enabling through images to document this important work.